"We've got the EP Booster that just seems to work best. We don't really experience a lot of signal loss, weirdly. You would've thought with all these pedals, even if you compare it with the strength of the amps, it is beyond me why there's even any signal coming out at the end of this. It really is, but the EP Booster seemed to give the best of itself at that point in the chain," says Josh Klinghoffer's guitar tech. Among the other pedals listed, EP Booster was also mentioned in this interview with Music Radar. Ryan posted a picture of his pedal board on Instagram on Jan 2, 2015 with a Xotic Effects EP Booster Pedal on the left column, second from the top of the board as pictured. In the premier episode of Pedal Power, Chris Shiflett (Foo Fighter) talks with Dweezil about his favorite pedal, the Xotic EP Booster. According to [this](http://www.premierguitar.com/articles/Rig_Rundown_Aerosmiths_Joe_Perry_and_Brad_Whitford) Premier Guitar rig rundown, Brad Whitford uses an Xotic Effects EP Booster pedal. Daniel from That Pedal Show build Gem his new (30th May 2017) pedalboard, where this pedal can be seen. Pedais & Efeitos: Qual o seu pedal favorito? Lúcio Maia: "Não tenho. Gosto muito do OCD e do EP Booster da Xotic." At 3:11 of this video there's a shot of Phil's pedalboard and the EP Booster can be seen. Phil says "I have the EP Booster, this is what happens, um depending on the volume of the amp - sometimes it’s too loud like in here I try not to make it too loud so I use a little bit of the EP Booster." In this picture, captured during a 5SOS rehearsal in London, and posted to Zoom Sound Factory's [Instagram](http://www.online-instagram.com/media/977456327251097211_480299252), Luke Hemmings' pedalboard shows that he is using a Xotic EP Booster pedal. The Xotic Effects EP Booster can be seen on Hozier's board in this photo posted to Facebook by TC Electronic. The pedalboard guitar tech Sean Haines assembled for Al Di Meola is pictured in this article of Premier Guitar. In this video from 2011, Ryan shows his EP Booster on his then-current pedalboard. It can be seen at 2:40. The pedal is connected to audio loops 1-5 on the RJM switcher. The output on the RJM switcher feeds the Marshall and this is the DRY signal flow. According to Premier Guitar, Gonzalez uses the Xotic EP Booster pedal. In this photo of Shearwater's pedalboards, in the Meiburg's pedalboard (which is the upper one), one of the pedals that can be seen is the Xotic EP Booster. According to her rig rundown, this pedal is also on her pedalboard. In this 2016 Guitar World article James is quoted saying: "I like to use a lot of low-wattage, old tube amps when I record. My obsession with that actually started with the Silvertones from the mid-late Sixites. On stage, I’ve been using a [Fender] Princeton and Custom Supro Thunderbolt. Guitar wise, I have a Gibson 330 I record a lot with, and my stage guitar is a 135. I also have a Nineties SG I use as a second guitar. I also use a lot of different things for pedals. 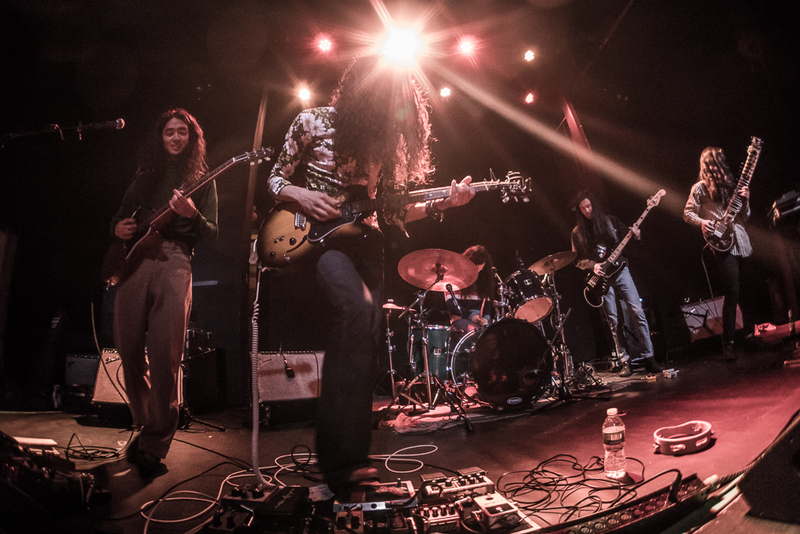 Lately, I’ve been using the JHS Colour box and Xotic EP Booster to get the amps where I need them to be." An Xotic Ep booster can be seen on Jonathan's board at :52 in this video. 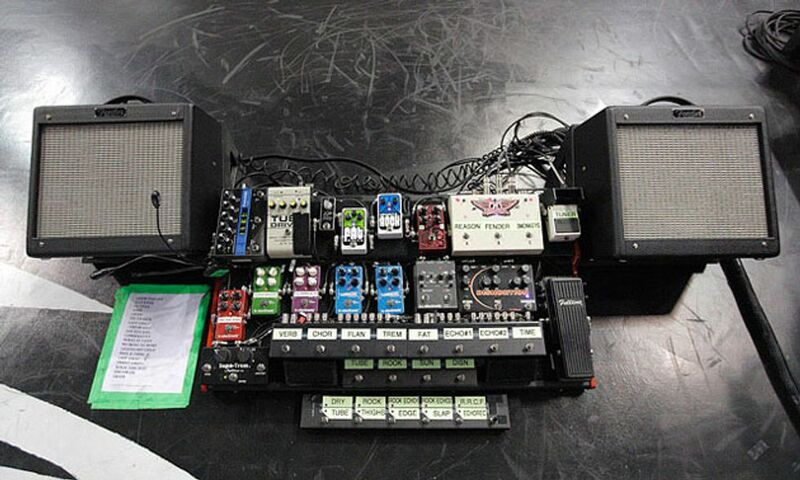 At 9:56, Daniel, the one building Andy Timmons' board, says, "The pedals that we have on the bottom row are: The EP booster [...]". "as for a solo boost, I run the xotic EP booster through my fx loop and it sounds killer"
As seen under "Main Live Pedalboard," on Bryan's [website](http://www.bryanbeller.com/cms/index.php?page=gear), he uses an Xotic Effects EP Booster pedal. 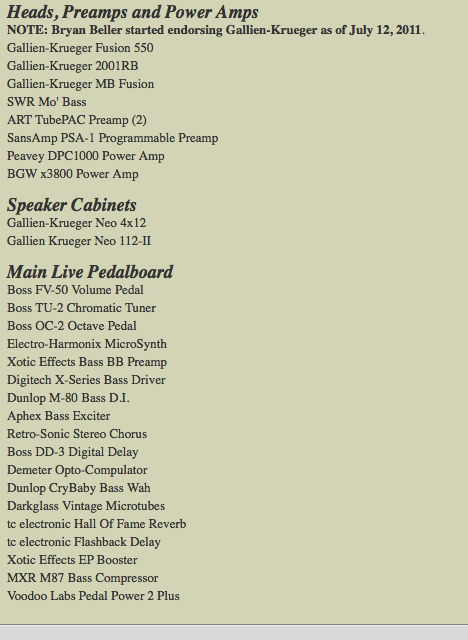 According to Premier Guitar's interview, one of the items listed under his "gear" is the Xotic EP Booster. "I know it doesn't look it but, I AM making progress!!" According to Strymon's pealboard feature, Gavin uses the Xotic EP Booster. The EP Booster Pedal can be seen at 4:08 of this video where Jeff Owen of Tenth Avenue North walks through the gear he uses on tour and in the studio during the "No Man Is An Island" tour. Scott's first pedal on his board is an EP Booster. He uses this for the tone as well as the small size. Contact Jason for Pedalboard photo. 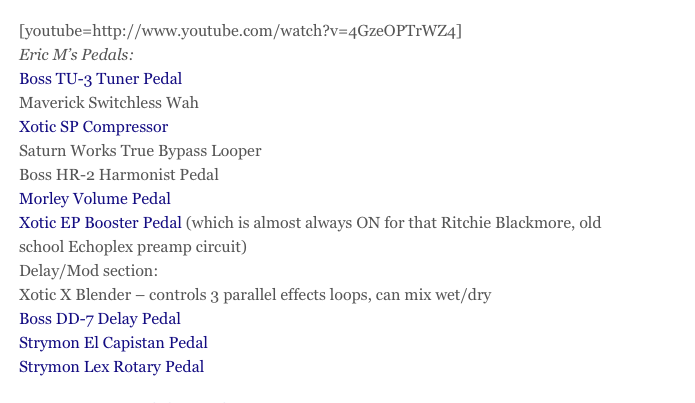 Eric Mardis uses an Xotic Effects EP Booster pedal, according to [Mass Resonator](http://massresonator.com/2013/05/5-best-pedalboards-from-mass-street-music-staff/). Compressor pedal on Tim Formgren's pedalboard. Visible on bottom row, second from right. "My pedal board tends to change over time. Right now I’m using: Xotic EP Booster - awesome line boost, very smooth." At around 5:00 this pedal is visible on his pedalboard. In this pedalboard photo posted from Stewart on his official Instagram profile, one of the pedals that can be seen is the Xotic EP Booster. Between the chromatic tuner and the boss delay, you can see his EP booster pedal. This is a great pedal designed to emulate the front end of an old Echoplex. It’s not an echo device, but rather a warmly voiced clean volume booster. It makes bad amps sound decent and good amps sound great. I love it! I typically put it right before the volume pedal in the chain. "set up 'palo y palo'"
Towards the end of the video, Matt begins turning his pedals off. An Xotic EP Booster can be seen. Shown up close at 0:49. The EP Booster can be seen next to his compressor, Deep Six by Walrus Audio. Picture taken before their performance at riot fest. It is on his pedalboard that he posted on his Twitter, Facebook, Instagram, etc. Very likely that this is the pedal placed inbetween the SlideRIG and Flashback Mini. Judging from the blue light and the single transparent knob. In Pedals Fusion's 2015 interview with Atsuko Chiba, Kevin showed off his pedalboard, which included a EP Booster. As can be seen from this picture, Hanno Busch posted on his official Instagram account, he uses the Xotic Effects EP Booster Pedal as part of his pedalboard setup. Tomo uses it at the end of the chain, Daoud after dirt, before delay. We can see it on his board. On minute 6:20 seconds or eariler, he mentions he's using his EP Booster and MXR Carbon Copy which is already on the list. 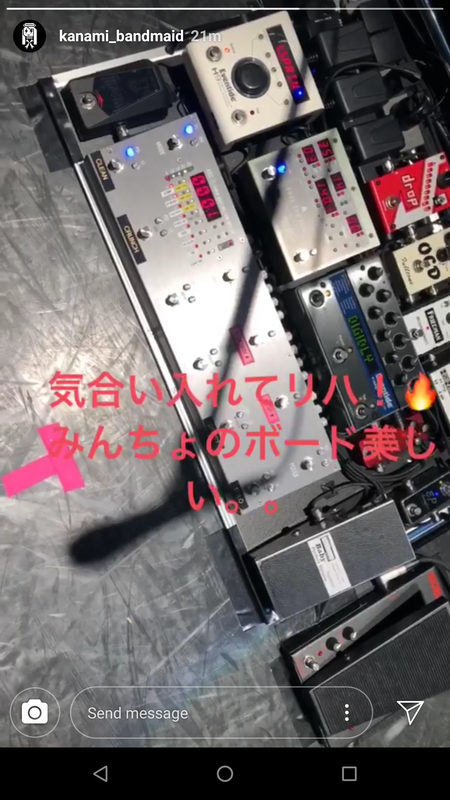 You can see a Xotic Effects EP Booster on this picture of Chiaki Sato's pedalboard on her Instagram account. Visible in this Instragram post by Honoré. Used during Luna's 2017 tour. At 14:48 you can see the EP Booster on the pedalboard. 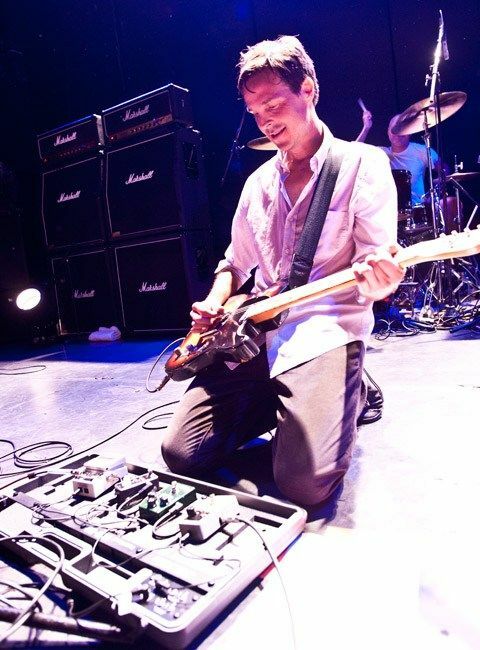 Under his sneaker you can see a small pedal with one acrylic knob and white contured plate. The pedal are seen in this Instagram post. booster utilizado por Sumire en su cadena de pedales durante la gira de GIRLS POWER. I really love this little boost. Currently I haven't been using it as a boost, I use the xotic SP compressor more for that. However, I keep this at the end of my chain, sitting on my amp; and I keep it on all the time. It sweetens up single coil tone so well! Always on after overdrive and distortion pedals. Sounds fantastic, adds clarity and body. No reason to ever turn it off. This pedal is extremely versatile. Clean boost, tone preamp, push your amp into overdrive, drive your pedals harder, it does it all and more. I always keep mine on and it adds great body to my tone. I use the EP Booster in the "Vintage" setting which means it rolls off a little high end and really thickens up the tone a bit, great for beefing up a clean sound or just kicking a already distorted amp just a little harder. Great pedal when you just need a bump! This booster have amazing control over tone, gain and volume with just the one knob. Versatile between genres it belongs on every pedal-nerd's board! Need to Go Above 11? This little pedal is great when you just need... more. It doesn't really alter tone in so much as it just makes everything louder, bigger, and richer sounding. Perfect for when you need to just give your tone a nice push. I don't consider it a necessity in my pedal chain, but it is better to have it and not need it than need it and not have it. EDIT: Okay so I recently changed the rating of this pedal from 4 to 5 stars because I recently acquired a power supply that allows me to run it at 18 volts. It is like night and day. There is so much head room now I have dialed it in to a point where I consider it an 'always on' pedal. Necessity achieved. Never leaving my board. I only use it to warm my sound up, and I have to say it works brilliantly! Works even better when used in an 18V power. Small, but really really powerful and defined. With the 2 internal switches you can also set 3 kind of equalization and a 3db boost. I have two on my board right now one to color my tone the other I use for everything from a clean lead boost to full on high gain rhythm distortion pushing the front end of my Oranges. Killer Pedal. Like a little box of tonal black magic that just makes you sound a bit more special. just get one, you won't be disappointed! I can't believe it. It sounds better than every OD I have ever heard! A nice way to get that echoplex tone. I set this to no gain and vintage with the DIP switches. It does something great to the tone of fender amps. I like it with the marshalls too but it doesn't sound as good with a marshall clean. This is a very nice pedal in front of any Fender tweed style tube amp. It actually makes them warmer. Use it previously with Angry Charlie to boost solo. As I said, turn the knob until you love it, set it, forget it. Bold and thick sound, bring back your stored drives, this might be what they needed it. There are many ways to describe this pedal... Bold and thick sound, but has some drive sparkle that produces a nice and classic overdrive when is all the way turned on. I'm playing with this one since two weeks ago and it helped to refresh my pedalboard signal. As my only amp is the Vox AC15C1, which is not cleanest at all, I'm using the EP Booster directly from the amp input by using a patch cable, then I plugged a long feet cable to the last pedal in my effects chain (right now the Empress Echosystem), and by this way I'm getting a good sound from the AC15C1, as I'm not having a transparent tone but I'm not feeling losing dynamics as I usually do because the guitar cables that I'm currently using. I'm just missing trying the Ep Booster into the Ibanez TS Mini, and some tries with the Dyna Comp but I suppose that the EP Booster will bring low frequencies into the TS Mini so it will feel and sound thicker (as I did this with a borrowed Fulltone Full Drive 2 ending in this result). If you are going to dismiss a thin sounding drive pedal, you might want to try the EP booster along with any drive and listen to the result. Right now, I put this pedal on Flat Eq mode at the end of the chain, still bringing magic tones. I'm thinking of putting this pedal after the reverb, on the Fender side, to push the mids. I'll try it tomorrow. Conjures a pillow-like quality that puffs up any signal nicely. Essentially, creatine courtesy of classic arena rock tube tape preamp. Wish the fuzz and volume were separate, but still a very good pedal and it def gets the job done. My favourite Volume Booster, not only that but has beautiful Warmth and Tone tone it. It is simple to use and effective at fattening up the sound while remaining articulate, open and fun to play. It is not a totally clean boost, which becomes apparent when turning it up. Then it adds more of its own gain structure. It loves being boosted too, and combined with an other booster or od-pedal it gets more compressed and feels a bit like a vintage and fat low gain fuzz. Internal dip switches helps tilting the eq from a low end emphasis to a more mid-focused sound or somewhere in between. This helps tailoring it to the pedals around it and the instrument you play. Sounds great on bass too. Never sure how to describe this gem. It just makes everything sound betta'! It's small, set it, forget it. That's really all I can say. No board should be without it, big or small. If I have two pedals, one will be an Archer, the other the EP Booster!